The form app is a great lead capture tool! 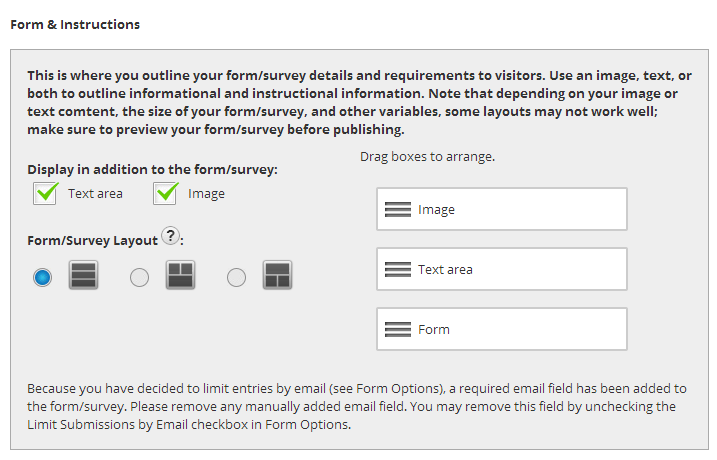 Users can create a wide variety of forms or surveys. Options include Form fields, comment fields for larger input, as well as radial buttons, drop down menu items, and checkboxes for survey questions. All these you can customize to build the form or survey needed to create the exact type for your needs. There are also options for how you allow visitors to enter such as enter 1x only (per email address), a set number of times they can enter, unlimited, or set a maximum total number of allowed entries for the entire form (helpful if you only want to giveaway a set number of something "first 10 to enter get xyz"). Included is a email sign-up checkbox to get approval to add users to your email list, including ability to customize your privacy message. The Form and Survey App is a great tool to use for email list growth, landing pages, registrations for events, and more! Find it in the Coupon and Lead Capture App area. 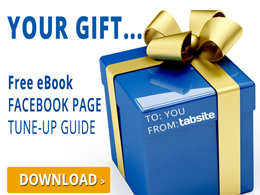 Yes, you can use the form or a survey on a Facebook Page, embed on your website (or both locations), or create a unique landing conversion page to drive traffic to. Upon logging in, you will be led to the Administrator Tools Page. 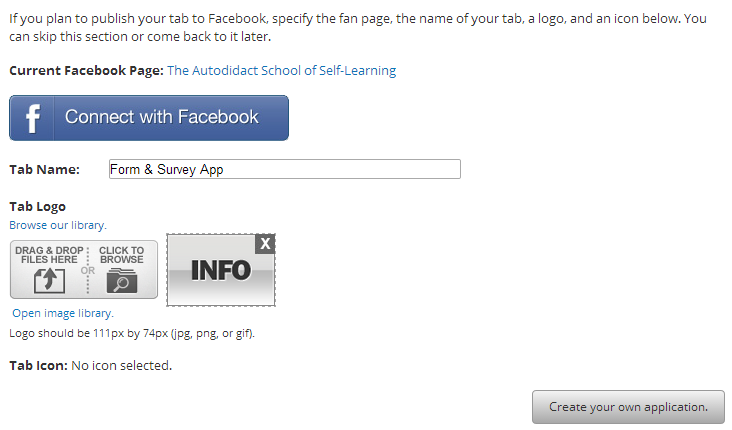 Search for the Forms and Survey App (It is under Coupon and Lead Capture Apps) and click the Add+ button. Forms & Survey App Builder setup area will load. In this section are settings you want your app to contain. It includes Form/Survey Setup, Privacy, Max Submission Settings. First on the Form/Survey Setup, type in the name of your Form/Survey and the email where you want submissions to be forwarded. 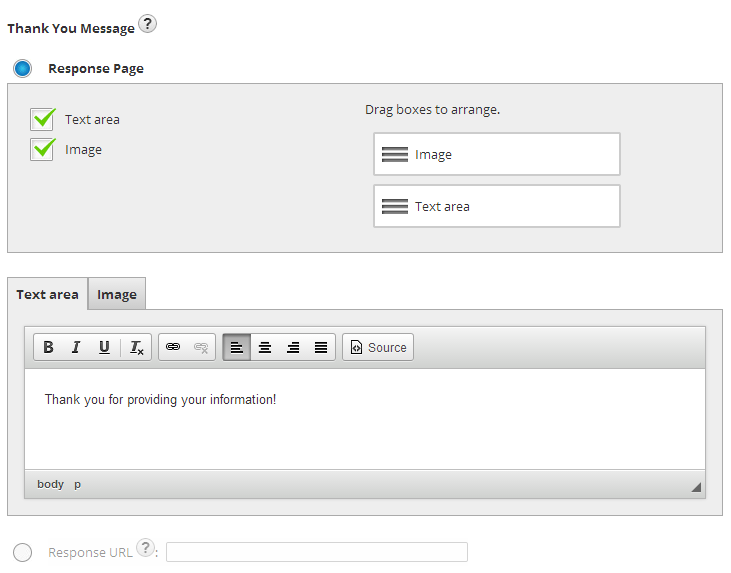 In Form and Instructions section, you design your form layout, imagery and text you want to display in your form. 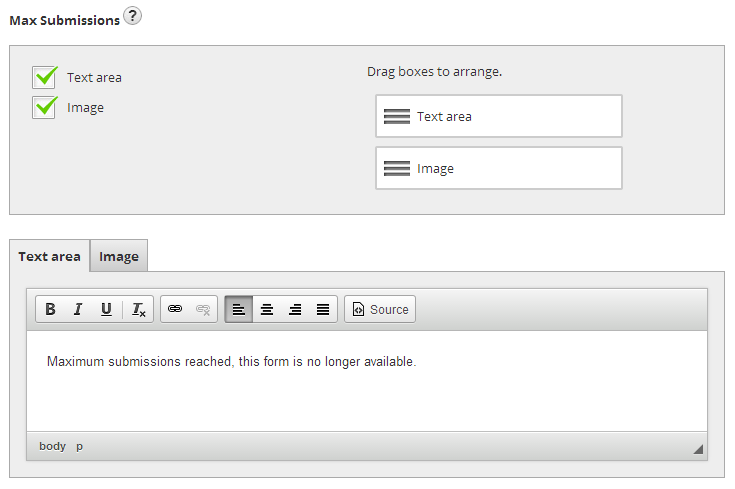 In this section, you can set the number of times a user or a unique email can submit form. You can put text in to display when the limit has been reached; And you may also include opt-in for a newsletter subscription. 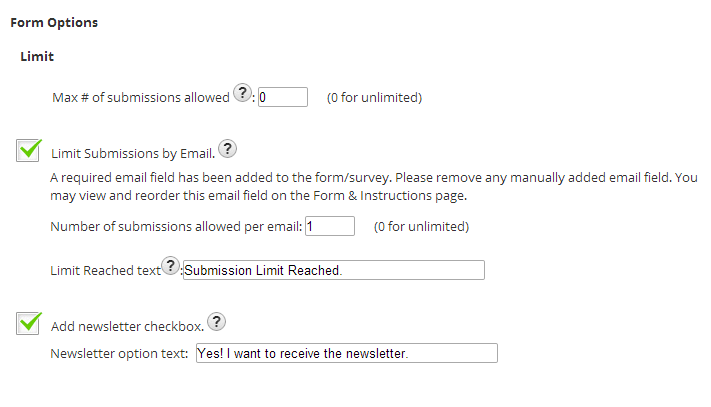 Set the Thank You response page to appear after form is submitted. You may also opt to forward to a Response URL of your own if desired after user clicks submit. You can modify the Facebook settings if you would like your tab to be published to Facebook. To enable your app to be shared in different social media sites, use the Social Sharing Options. These sites consist of Facebook, Twitter, Google+ and Pinterest. You can modify the image position, input your title, description and carry out the engagement process with the social networks. Blog/Web Callout Tool if set will forward your visitors to your Facebook Tab. 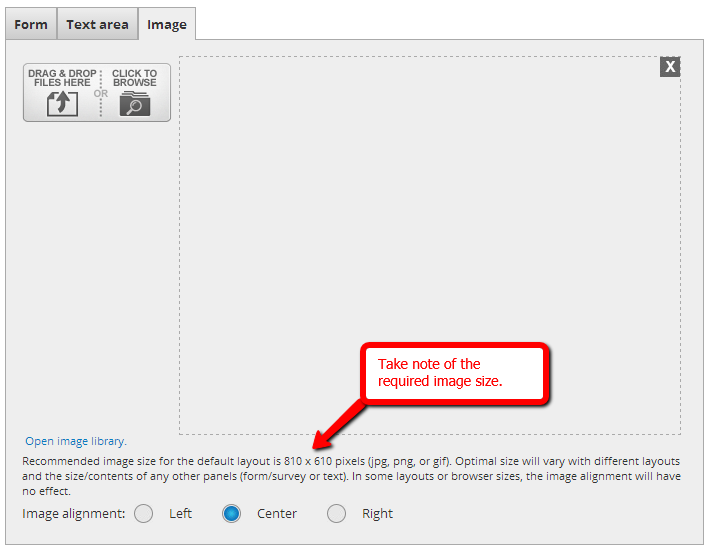 Uploading an image will generate code that can be embedded to your website, blog or elsewhere you'd like to put your call-out image. By setting the post planning option whether by Buffer, Sendible and Hootsuite, you can schedule posts on your social media accounts such as to your Facebook page/profile, Twitter and more that links to the app. A SMART URL is used being conducive to PC and mobile sharing. 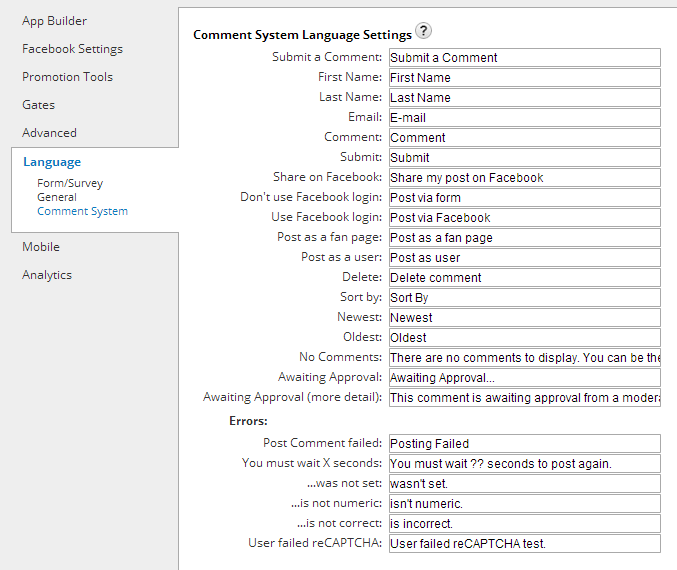 You can enable commenting of visitors via the Comment System. 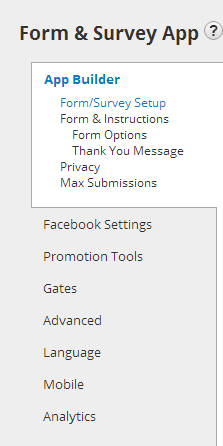 You may set whether you want to enable your visitors to comment via their Facebook account or a form. You can also set if you want to receive notifications sent to your email whenever a visitor post a comment or set to require comment approval. Like Gate is a setting that requires your visitors to like your Facebook page first prior for them to access your content. Advanced setting is for those who want to customize apps by manipulating features and/or CSS codes. Here, you can edit the Link Color, Text Color, Background Color and your CSS programming code. The default settings for the CSS are already provided. In Language settings, you can opt for the text and language you prefer to be displayed on your apps' text fields. You can choose to set your app to show a mobile device version to mobile users and you can also opt-in or out of the use of a like gate for mobile users. The setting for mobile defaults to mobile version and Like Gate as "on." Multiple graphs make up the Analytics section. You can see analytic graphs for Overview, Facebook Views, Web Views, Mobile Views, Microsite Views, Shares and Likes. Click any option to display only stats for that option. You can also access and export form results from this Analytics area. Finally, don't forget to click Save when you're done. After you finished clicking the Save button, the page will take you to the My Apps tab. In this location, you will see all the TabSite apps that have been created. You can create the apps, test them and finally, publish them in accordance with the features of your Plan. Click "Publish" to undergo all the details of publishing your app to Facebook and to get your embed code to use the app on your website or blog. The dropdown menu has quick access features for adding the tab to Facebook (or removing it), getting your Smart URL, and more.